The increasing complexity, rapid change, and often unpredictable outcomes of city-design-and-building processes demand new modes of practice that are responsive and adaptive to the specifics of such changing contexts in the twenty-first century. These include open-ended outcomes, rather than rigid and predictable products, that emerge out of interactions with a specific context, specific communities and specific interactive processes. This article describes how we can design such new practices of transformative urbanism, derived largely—but not exclusively—from the innovation, resourcefulness and collective creativeness of informal urbanisms. To illustrate such new practices of transformative urbanism, the author describes an experiment in the city of Toronto undertaken as a partnership between the residents of the Thorncliffe Park neighborhood and urbanists from the University of Toronto. The article concludes by describing several promising results of the experiment. The author would like to acknowledge the following University of Toronto scholar-practitioners who contributed to this paper through the brilliant work they carried out in this community collaboration in Thorncliffe Park: Lauren An, Anni Buelles, Kelsey Carriere, Stephanie Cirnu, Aviva Coopersmith, Maria Grandez, Kelly Gregg, Michael Hoelscher, Jonathan Kitchen, Maria Martelo Mesa, Noha Refaat, Mercedes Sharpe Zeyas, Andrew Walker, Louise Willard, Jennifer Williamson, and Frances Woo. 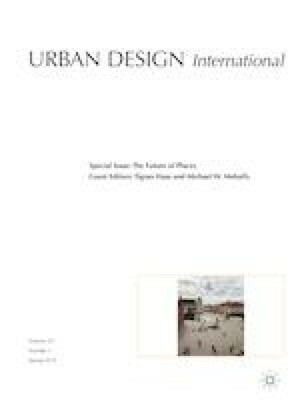 The author would also like to thank the guest editor of this special issue of Urban Design International, Dr. Tigran Haas of KTH Royal Institute of Technology, for his gracious invitation and generous support in the writing of this article. Parsons School of Design, The New School, and Faculdade de Arquitetura e Urbanismo, Universidade de São Paulo. 2014. PIER TO PIER LAB: An Interdisciplinary Workshop to Explore the Topic of Informal Urbanisms, final report multimedia report of the workshop in São Paulo. https://piertopierlab.wordpress.com/. Accessed 8 Sept 2017. Parsons School of Design, The New School, and Faculdade de Arquitetura e Urbanismo, Universidade de São Paulo. 2015. Agents of Public Space, final multimedia report of the workshop in New York. https://agentsofpublicspace.wordpress.com/. Accessed 8 Sept 2017.